Tailored, quality and consistent housing advice direct to customers on your website. The Homelessness Reduction Act has enhanced the duty of local authorities to provide advice to everyone with a housing problem. A key challenge is managing increasing demand, whilst ensuring those most at risk receive appropriate advisor support. Imagine if the vast majority of applicants for advice were directed to a comprehensive self-service tool on your website. They required no input from any advisors or customer-support staff. Yet they received quality, tailored and consistent advice written by legal experts. 70% of customers expect your website to include a self-service tool*, accessible even when your officers are not. AdviceAid SelfServ is a self-service application that is accessible from your website. 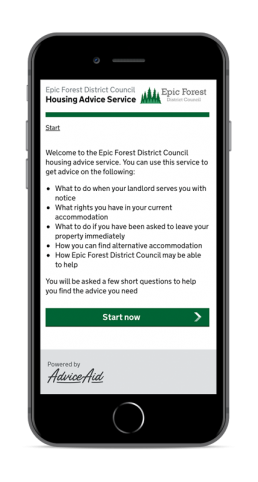 It provides tailored, quality and localised housing advice in response to your customer’s needs and circumstances. Advice covers tenant rights benefits, harassment, S21 notices, mortgage arrears, domestic abuse, rights of occupation, welfare reform, illegal eviction, rent arrears, housing disrepair and much more. AdviceAid is also available as a tool for advisers to be able to give clear, quality and tailored written advice. Powering your advice services with AdviceAid enables you to provide a consistent approach across platforms – reinforcing the support you are giving to customers.